The 2015 Fall Dance will take place on Saturday, September 26, from 7 to 10 pm, at Grace United Methodist Church in Huntsville, Alabama. Who: All Alabama & Tennessee Valley area homeschool highschool students, regardless of cover school, are invited. Homeschoolers may invite up to two non-homeschooled guests. Cost: Tickets will be $15 August 1st through September 1st, then $20 until September 24th. Tickets: Tickets must be purchased on-line by September 24th. No tickets will be sold at the door. Menu: Light snacks and beverages will be provided throughout the evening. Chaperones and Safety: The entire evening will be well-chaperoned by volunteer adults. We will require an emergency contact number for every attendee. Drop Off and Pick Up: Due to space constraints, parents may not accompany their children to check-in (unless there is a special need). Pick up is at 10:00 p.m. If a child leaves before 9:00 p.m., parents will be called or texted. More questions? We've got answers! 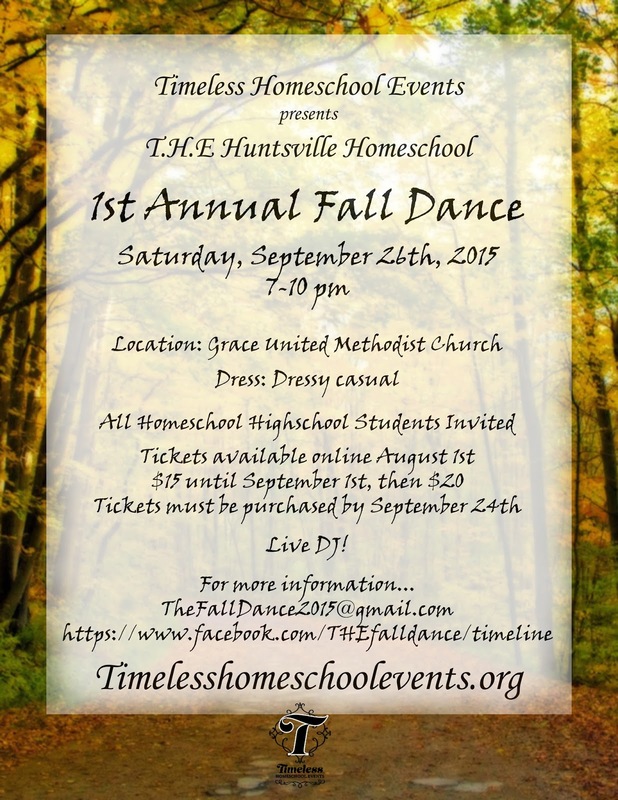 E-mail us at thefalldance2015@gmail.com.